This home has the beautiful original woodwork and features formal dining with original stain-glass windows in the bay window, built in china cabinet with lead glass windows, oak kitchen with ample cabinets and 2 pantries, Main floor utility, full bath, and a den/office. Beautiful stunning entry way with open staircase to upper level which has 2 bedrooms and the massive master suite with large walk-in closet and Jacuzzi. There is also a 1/2 bath on this level. The full attic has more available space for future expansion. There is a full semi-finished basement where walls and floors have been upgraded and is in great condition. Also a 1 bedroom apartment for mother in-law or anyone. The home has all new energy efficient windows, it was rewired and plumbed and is ready to be moved into. There will be a new roof and fascia repair when weather allows. Don't miss out. 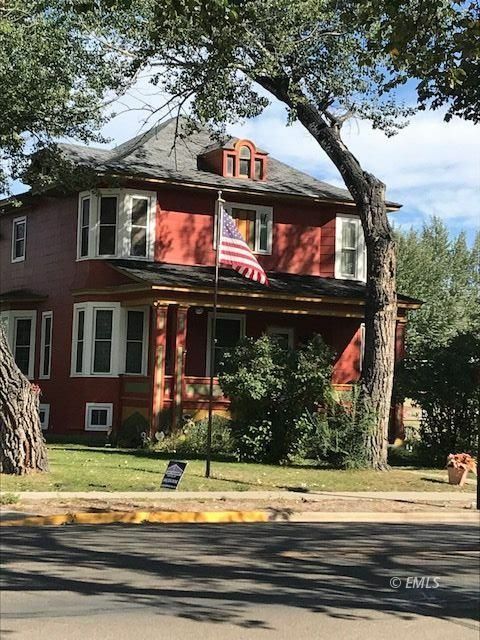 THE HOME IS IN MILES CITY HISTORICAL DISTRICT. Located out of flood zone. Sellers will consider carpet allowance.